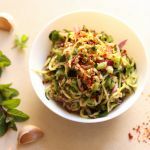 Raw Zucchini Salad With Refreshing Mint And Chili! 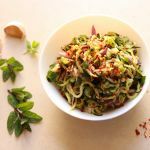 Next time you’re having a busy week, or can’t decide what salad to have for lunch, let me suggest this simple, yet refreshing, quick, raw zucchini salad! 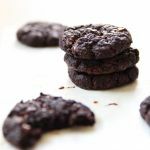 It’s super easy to make, light, spicy, minty, and of course, vegan! If you are thinking of buying yourself a spiralizer, I say, do it! I’ve recently bought one, and can’t get enough of it! Seriously, there are infinite veggies, and fruit, you can spiralize, if you just let your imagination go wild! So, something to think about. Spiralize the zucchini, or make shavings, with a veggie peeler, and place in a bowl. Next, peel, and cut the onion in half, then slice into long strips. Finely slice the celery stalks, and add everything to the zucchini bowl. In a separate bowl, add the crushed garlic, along with the olive oil, lemon juice, and lemon zest. 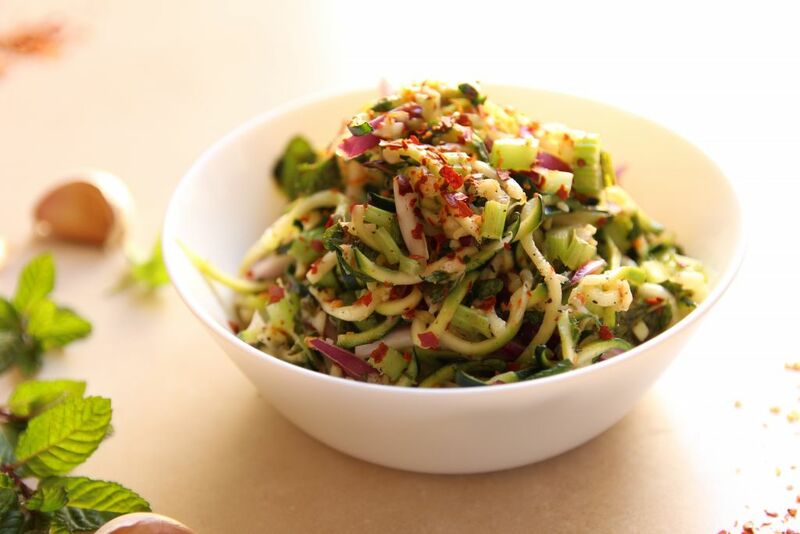 Give it all a good mix, then add the dressing to the zucchini salad. ← Mini Lemon Cheesecakes Without Cashews! Oh this sounds perfect for lunch! All those refreshing flavours and a bit of heat with the chilli, perfect 🙂 I do have a spiraliser which has been lounging about at the back of the cupboard through winter, I’m inspired to get it out again for spring! What a wonderfully flavoursome, yet simple dish! My kind of food! I have a Spiralizer – fab, aren’t they? I love using it to make oven-baked potato crisps… so much healthier than store-bought ones, plus I get to use my own seasoning blends. Win! Have you tried spiralising beetroot yet? Quite apart from it being utterly beautiful to look at, if you massage in some balsamic reduction, and lightly season it with sea salt and black pepper, then bake it in the oven, it comes out wonderfully caramelised! Yaya! I love how fresh and full of flavour this looks! So quick and easy to put together as well. I bet this makes a brilliant lunch.